Marcus Osmond Smart, professionally known as Marcus Smart is an American professional basketball player. He currently plays for the Boston Celtics of the National Basketball Association (NBA). He plays in the shooting guard/point guard position. Previously, he was drafted by the Celtics with the sixth overall pick in the 2014 NBA Draft. He played college basketball at the Oklahoma State University. He has over 390k followers on his Instagram. Where is Marcus Smart born? is in Flower Mound, Texas in the United States. He holds American nationality. His zodiac sign is Pisces. He has 3 older siblings, Todd Westbrook, Jeff Westbrook, and Michael Smart. His brother Todd died at the age of 33. He attended Edward S. Marcus High School in Flower Mound, Texas. He achieved a record of 115-6 through three seasons at high school. He was a two-time 5A state champion. He was also named a McDonald's All-American and was an ESPNHS first-team All-American. ESPN.com considered him a five-star recruit and was listed as the No. 1 shooting guard and the No. 10 player in the nation in 2012. He committed to play for Oklahoma State University. He led the Cowboys to a 24-8 record finishing in the third place in the Big 12 during his freshman year. He averaged 15.4 points, 5.8 rebounds, and 4.2 assists per game. He tied an OSU single-game scoring record with 39 points against Memphis in November 2013. Smart was suspended for three games after he shoved a fan in the stand after a verbal altercation against Texas Tech in February 2014. He claimed the fan yelled a racial slur at him. He was named one of the 30 finalists for the Naismith College Player of the Year. He became the first player in NCAA tournament history to record 20 points, 10 rebounds, 5 assists, and 5 steals recording 23 points, 13 rebounds, 7 assists, and 6 steals. He averaged 16.6 points, 5.9 rebounds, 4.5 assists in 33.1 minutes per game during his two seasons at Oklahoma State. He forgoes his final two years and declared for the 2014 NBA draft. Boston Celtics selected him with the sixth overall pick in the 2014 NBA draft. He joined Celtics for the 2014 NBA Summer League. He signed a 2-year deal worth $6.71 million with the team in July 2014. He sprained his left ankle in just his fifth NBA game and missed 10 games with the injury. He returned to action in December and was assigned to the Maine Red Claws of the NBA Development League. He was suspended for one game without pay for hitting San Antonio Spurs forward Matt Bonner in the groin in March 2015. He was named to the NBA's All-Rookie Second Team in May 2015. He dislocated his two fingers on his right hand while playing at the 2015 Las Vegas Summer League in July 2015. He missed 18 games with a lower left leg injury between November 22 and December 26 in 2015. He recorded his first career triple-double with 10 points, 11 assists, and 11 rebounds making him the first Celtics player to record a triple-double off the bench since Art Williams in 1971. He missed 11 games between January 24 and February 14 in 2018 after cutting his hand on glass at the team hotel in Los Angeles. He was ruled out for the rest of the season with a torn ligament in his right thumb in March 2018. 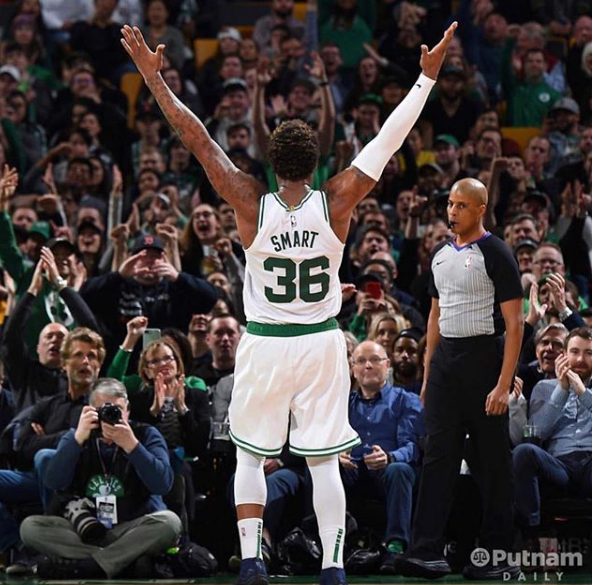 The Celtics tendered a qualifying offer to make Smart a restricted free agent in June 2018. In July 2018, he re-signed a four-year deal with the Celtics worth $52 million. Who is Marcus Smart Dating? Marcus Smart is unmarried. However, there is no official news about his affairs. He might be dating someone or he might be single. He has kept a low profile regarding his personal life. No rumor about his affair has surfaced yet. What are Marcus Smart's Body Measurements? Marcus Smart stands at a height of 1.93 m i.e. 6 feet and 4 inches tall. He has a body weight of 220 lbs i.e. 100 kg. He has an athletic body build. 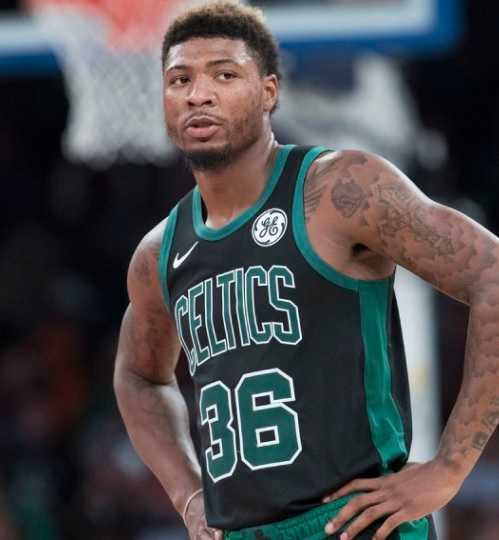 What is Marcus Smart's Net Worth? 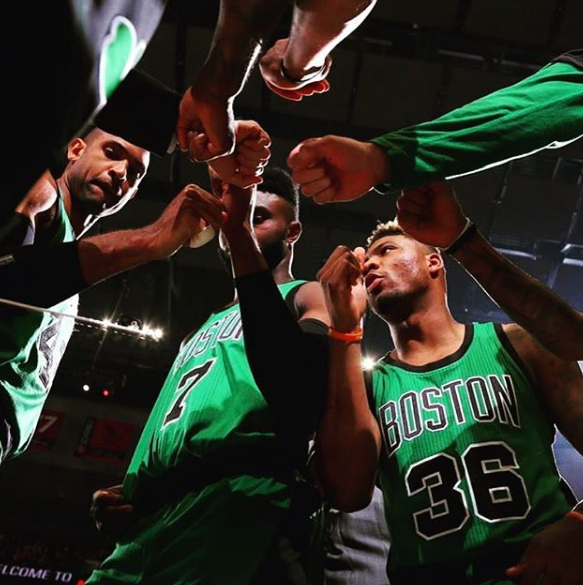 Marcus Smart earns playing basketball in the NBA. Salary, bonuses, incentives, and contract extensions are the main source of income. He also has an endorsement deal with Adidas. Playing for the Boston Celtics, he re-signed a four-year deal with the Celtics worth $52 million in July 2018. He has an estimated annual of $13 million. As of 2019, his net worth is estimated at $5 million. His mother died of myelodysplastic syndrome in September 2018. He played competitive football until sixth grade. He enjoys playing tennis in his spare time.